Environmental awareness is at an all time high. People all around the world want to do their part to lessen their negative impact on the earth. From recycling, to reusing, to using biodegradable products, the number of things you can do to help the earth is incalculable. It is biodegradable (even if you use a sealant as most sealants will eventually biodegrade. But not if is is dipped in resin). The products used are non toxic (as long as you use a non toxic sealant, which many are. If you use a nail polish varnish it is not non-toxic. I use only water based non toxic sealants for my jewelry). It is made of paper which is a renewable resource. I really love this paisley set. It is grand, yet subtle. It is eye catching and delicate. Sure to add a special touch to the bride’s ensemble! 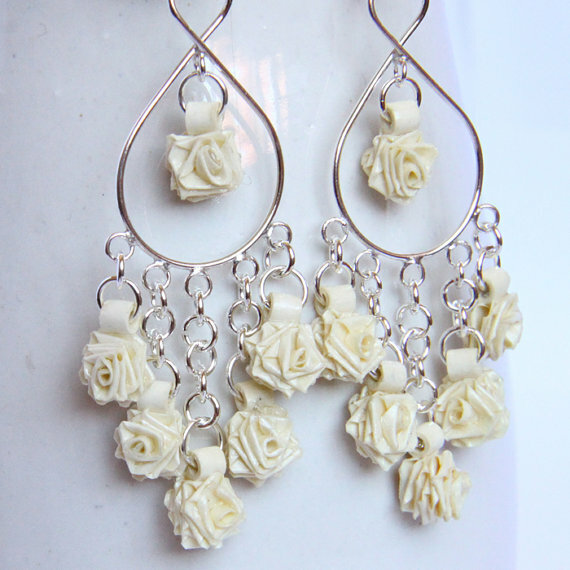 These delicate rose chandelier earrings are the perfect accessory for a bride. Beautiful and romantic, they are created with sterling silver findings. This delicate floral design is perfect for modern weddings. It can be made in any color to suit your wedding! This smaller lattice is great for brides who prefer smaller earrings, or as bridesmaid gifts. Like all of my other earrings, they can be made in any colors! This lotus design is one of my favorites. I can create them just for the colors in your wedding! They are feminine and romantic, perfect for a wedding. Those are just a few of the specific wedding earrings I have in my etsy shop. I can also do custom designs, and any of my other designs can be made in custom colors. Contact me any time for the jewelry you want for your special day!